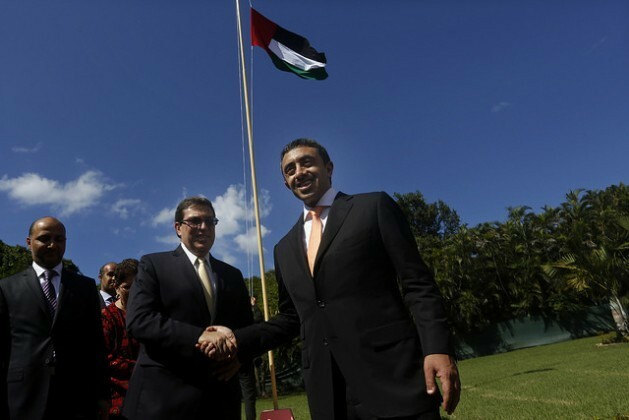 HAVANA, Oct 6 2015 (IPS) - Cuba and the United Arab Emirates agreed to strengthen diplomatic ties and bilateral cooperation during an official visit to this Caribbean island nation by the UAE minister of foreign affairs, Sheikh Abdullah bin Zayed Al Nahyan. During his 24-hour stay, Al Nahyan met on Monday Oct. 5 with Cuban authorities, signed two agreements, and inaugurated his country’s embassy in Havana, which he said was a clear sign of the consolidation of the ties established by the two countries in March 2002. “I am sure that the next few years will witness the prosperity of our ties,” he added during his official meeting with his Cuban counterpart, Bruno Rodríguez, with whom he signed an agreement on air services “between and beyond our territories” which will facilitate the expansion of opportunities for international air transport. In the meeting, Rodríguez reaffirmed his government’s support for Arab peoples in their struggle to maintain their independence and territorial integrity. According to official sources, the two foreign ministers concurred that the opening of the UAE embassy is an important step forward in bilateral ties and will permit closer follow-up of questions of mutual interest. Al Nahyan also met with the first vice president of the councils of state and ministers, Miguel Díaz Canel. The two officials confirmed the good state of bilateral ties and the possibilities for cooperation on the economic, trade and financial fronts, Cuba’s prime-time TV newscast reported. 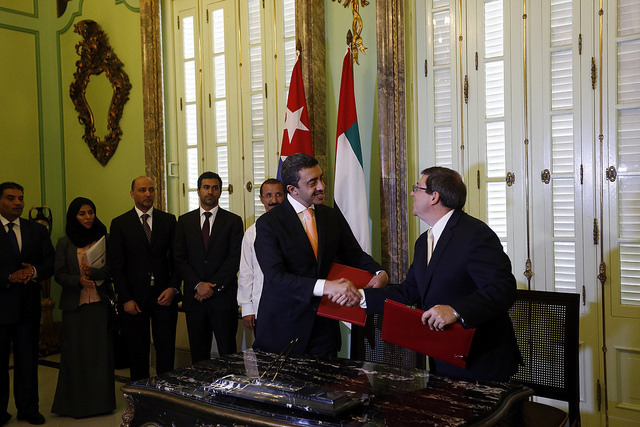 Cuba’s minister of foreign trade and investment, Rodrigo Malmierca, signed a credit agreement with the Abu Dhabi Fund for Development, to finance a solar energy farm that will generate 10 MW of electricity. 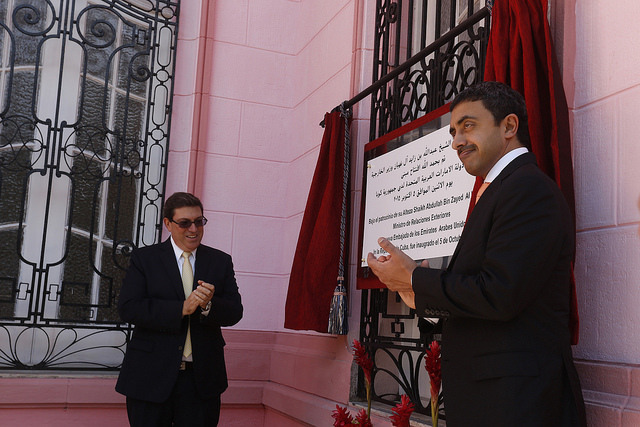 Al Nahyan first visited Havana on Oct. 1-2, 2009 in response to an official invitation from minister Rodríguez. On that occasion they signed two agreements, one on economic, trade and technical cooperation, and another between the two foreign ministries. “We have great confidence in Cuba’s leaders and in our capacity to carry out these kinds of projects,” Al Nahyan told the local media on that occasion. United Arab Emirates, a federation made up of seven emirates – Abu Dhabi, Ajman, Dubai, Fujairah, Ras al-Khaimah, Sharjah and Umm al-Quwain – established diplomatic relations with Cuba in March 2002, in an accord signed in Cairo. The decision to open an embassy in the Cuban capital was reached in a June 2014 cabinet meeting presided over by Sheikh Mohammed bin Rashid Al Maktoum, the UAE vice president and prime minister, and the ruler of Dubai. In late February 2015, Al Maktoum received the letters of credentials for the new ambassador of Cuba in the UAE, Enrique Enríquez, during a ceremony in the Al Mushrif Palace in the Emirati capital. Later, UAE Assistant Foreign Minister for Political Affairs Ahmed al Jarman and Enríquez discussed the state of bilateral relations and agreed to take immediate concrete steps to expand and strengthen ties in different areas. Enríquez also met with Cubans living in Abu Dhabi with a view to bolstering relations between them and their home country. They agreed on periodic future gatherings. In May 2014, the UAE and Cuba signed an open skies agreement to allow the airlines of both countries to operate in each other’s territories, as well as opening the door to new plans for flights between the two countries, the UAE General Civil Aviation Authority (GCAA) reported. The accord formed part of a strategy to boost trade with other countries, said Saif Mohammed al Suwaidi, director general of the GCAA, who headed a delegation of officials and representatives of national airlines during a two-day visit to Cuba. The UAE signed similar agreements with other Latin American countries, including Argentina, Brazil, Chile, Colombia and Mexico, as part of its effort at closer relations with this region, which is of growing interest to the Gulf country. Talks have also been announced between the UAE and Russia to build a giant airport in Cuba, which would serve as an international airport hub for Latin America, the Abu Dhabi-based National newspaper reported in February. The proposal is being discussed by the Russian government and the Abu Dhabi state investment fund Mubadala, mandated to diversify the emirate’s economy. In 2013 and 2014, UAE was named the world’s largest official development aid donor in a report released by the Development Assistance Committee of the Organisation for Economic Cooperation and Development (OECD). In 2013, the Gulf nation provided five billion dollars in ODA to other countries. Last year, according to OECD data, the only Gulf country to have a Ministry of International Cooperation and Development spent 1.34 percent of their gross domestic product in development cooperation.